GABARRÓN presents its new range of ACTIVE storage water heaters, which offer the perfect balance between comfort at home, energy savings and providing great space efficiency. What should I consider for choosing a storage water heater? It is important to consider certain factors when choosing a storage water heater. Technical features, qualities, capacity of the storage water heater or the own requirements of the installation, are factors that will help us in selecting the ideal storage water heater to cover the comfort needs of the home. Electrical water heaters from GABARRÓN offer the best anti-corrosion technology, which ensures the best quality and a long working life. To give sufficient protection against corrosion, water heaters incorporate a large magnesium anode. The durability of our water heaters is explained by the fitting in their interior of a steel tank with a double layer of enamel, of top quality, vitrified at 850 0C, with uniform thickness and perfect adherence. Both materials give the water heaters extra durability, even in challenging working conditions. 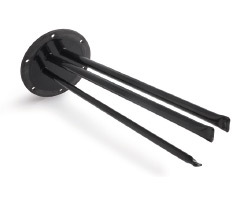 The ACTIVE MULTIFIX range has independent sheathed heating elements, which makes them more durable as they are not in contact with the chemical agents of the water. One of the great advantages of using this type of heating elements is that they can be replaced, if necessary, without the boiler needing to be first emptied. As the heating elements are totally independent, the boiler can continue to run and provide hot water if one of the resistances fails. These sheathed heating elements, together with the magnesium anode and steel tank with double lining of titanium enamel vitrified at 850°C, give the heater maximum protection against corrosion, as well as exceptional durability. The ACTIVE SLIM range includes electric direct-immersion reinforced heating elements. Thanks to the exclusive water inflow diffuser, the water is gradually distributed through the storage water heater, preventing a sharp mix of the cold water entering and the hot water inside the tank, which optimises the storage water heater’s performance. Injected polyurethane between the casing and the cylinder is used as the thermal insulation. The polyurethane is FC and HCFC free which makes it environmentally friendly and it has a very low thermal conductivity coefficient for greater energy savings. 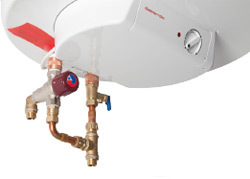 All the GABARRÓN electric storage water heaters come with a non-return safety valve to ensure that the hot water does not return to the mains if pressure increases inside the storage water heater. They also have dielectic pipe fittings to insulate the storage water heaters from the installation, which prevents galvanic couples forming in the water inflow and outflow pipes. They reduce the corrosion which helps to lengthen the life of the storage water heater. With the ECO SMART mode, GABARRÓN water heaters offer a perfect balance between saving on energy consumption and the desired comfort. The Eco Smart mode is particularly appropriate for recurring habits in the use of hot consumption water, such as if we take a shower every day at more or less the same time. After the activation of the Eco Smart mode, the water heater will memorize our consumption habits for 7 days and will then apply them to heat and prepare the water at the regular times, so the consumption of electricity outside those periods will be reduced. The Active Multifix and Slim electrical water heaters incorporate the Frost Protection mode to protect the heater against low temperatures. If the water heater will not be used for a long period of time, we recommend you protect it from freezing by selecting the temperature level (Frost Protection). At this temperature, the heater will keep the water temperature at around 10ºC to prevent possible freezing. If the water temperature in the tank does not reach 65ºC for 14 consecutive days, the anti-legionella function heats the water up to 70ºC and keeps this temperature stable for 120 minutes to protect against legionella. Protection system which prevents fire if the water heater is not full of water.